What Is The Titan Pro Jupiter XL? 6 Things The Titan Pro Jupiter XL Is Capable Of! How Does It Compare To Other 3D Chairs? Final Recommendation: Is The Titan Pro Jupiter XL Massage Chair Worth Considering? 3D Rollers Combined With 53'' L-Track Allows For An Incredible Full Body Massage! For A 3D/L-Track Chair, It's Very Reasonably Priced! 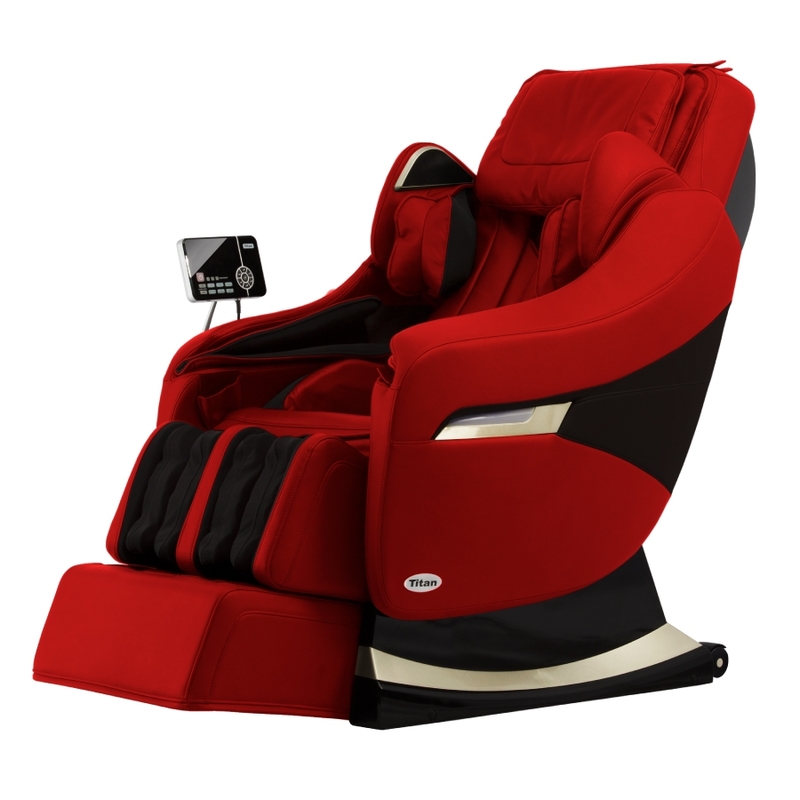 Titan Pro Jupiter XL is a high end massage chair that’s famous for having 3D rollers with an extended tracking range (L-Track). As far as overall intensity is concerned, this chair can do a 7-8 on a scale of 1-10. Is it capable of doing deep tissue massage? Well, the answer is it depends. Deep tissue massage is not some “fixed” intensity that works for everyone. The intensity required for a 120-140 lb body is much less than the intensity required for a 180-220 lb body. Deep tissue intensities therefore vary from one individual to another. What I think is deep tissue may not necessarily be what you think. That being said, this chair can massage at deep tissue intensities if you need it to. However, it’s probably not the best “deep tissue” chair you can find out there i.e. there are chairs that can massage at much stronger intensities. Does that make it a bad chair? Absolutely not! 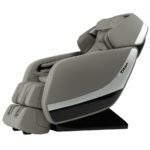 The Titan Pro Jupiter XL is actually one of my favorite massage chairs, and once you read this review, you’ll be able to see why. Finding a chair with 3D rollers isn’t difficult. Similarly, finding a chair with L-Track rollers won’t be a challenge. However, finding a chair that has both 3D rollers and L-Track? Good luck! It’s very uncommon to find a chair that has both of these things. If you look at most of the 3D chairs I’ve previously reviewed such as the Pro Dreamer, Pro Cyber, and even Titan’s Pro Executive, you’ll notice that they all have a standard 31 inch tracking range. If you’re unfamiliar with massage chairs, you’re probably a little lost at this point. What’s L-Track? What are 3D rollers? L-Track & S-Track are 2 terms everyone in the massage chair industry seems to toss around. Both talk about one thing: roller tracking span i.e. how far a roller is able to move from the neck downwards. S-Track and L-Track are similar in that they both contour to the spine’s natural curvature. They are different in their tracking range/span. S-Track chairs typically have rollers that can track 30-32 inches from neck to tailbone. L-Track chairs on the other hand typically have rollers that can track 47-53 inches from neck to hamstrings. So next time you hear a salesman using “S-Track/L-Track”, that’s really all it means! The animation below illustrates how L-Track functions for the Pro Jupiter XL. Now that you know what L-Track is, let’s talk about 2D/3D rollers. 2D is the most common type of roller you’ll find in most massage chairs. The simplest from all roller types. 2D rollers move up/down and side to side. They are referred to as 2D because of the 2 dimensions they move in. If you imagine your back as an A4 sheet of paper, 2D rollers will move up and down and left and right. Same as 2D rollers with one difference: 3D rollers can protrude in/out in addition to the up/down and side to side movements. Using the same example of A4 paper, you now have movement in 3 dimensions: Up/down, left/right, and in/out of the paper. What difference does the additional dimension make? A massive difference. The ability of rollers to protrude in/out directly affects the pressure/intensity on an individual’s back. A greater outward protrusion means a stronger massage intensity. On the contrary, a more inward protrusion means a lighter, milder massage intensity. What’s the purpose of a massage chair? Most will agree that the purpose of a massage chair is to simply provide an automated solution to the real thing. In other words, it aims to closely mimic a massage delivered by a trained, skilled therapist. Agree? If like me you agree with the purpose above, you can see why manufacturers are always coming out with improvements to roller technology (3D/4D etc.). Don’t get me wrong, there’s tons of marketing around these fancy technologies, but that doesn’t make them marketing gimmicks. These technologies are actually effective and for this reason worth considering! Airbags provide a compression massage. Airbags are very useful at gripping or holding a part of the body firmly in place. This makes them especially great for stretching routines. Where are all 44 airbags located? It’s very uncommon to find a chair that has head airbags. Neck airbags definitely, but head compression massage is a definite bonus! This chair also has airbags located on either side of the shoulders. Same thing with the arms. To twist, contort and stretch the hips. To squeeze, and compress the hips. 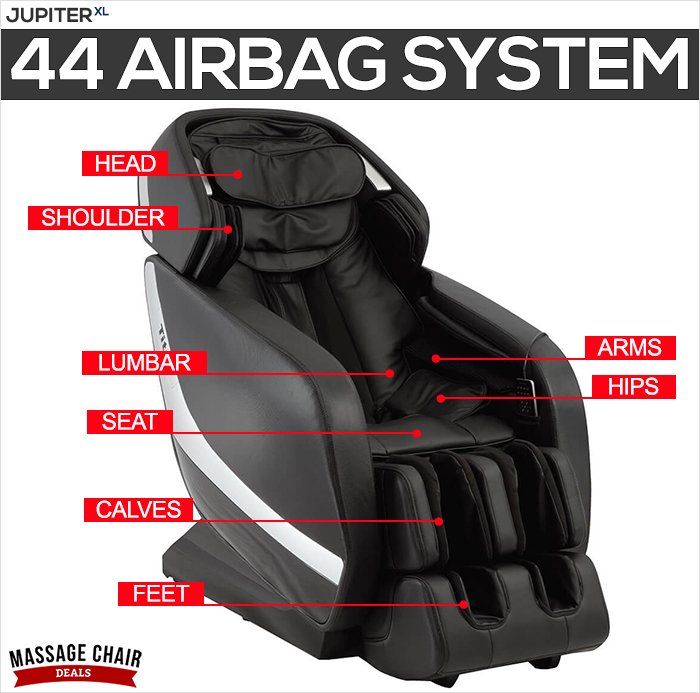 Last but not least, the Titan Pro Jupiter XL massage chair has several airbags located in the calf and foot area. These airbags not only massage the feet and calves, but also ensure the feet remain firmly in place, so the foot rollers can massage the soles of the feet. Airbag intensity can be adjusted to 5 different levels ranging from weak to strong. With the exception of a few, every massage chair on the market can recline to a zero gravity position. This chair is no different. Not sure what zero gravity is? Zero gravity is simply a recline position where the legs are slightly elevated with respect to the heart. A characteristic of zero gravity is when the upper legs form an angle of 128 degrees with the torso. What does this look like? Check out the animation below! Massage is super effective as your body experiences the least stresses in this position. Because of the almost horizontal position, it’s easier for your heart to pump blood to different parts of the body. Improved breathing because your lungs are at an expanded capacity. Lumbar or lower back region. 99% of massage chairs all have heating elements in the lumbar area. Very few have heat sources inside the seat or around the calves, so this definitely distinguishes the Pro Jupiter XL from the rest! This chair comes loaded with 10 auto massage routines. These are great because they require no setup. Simply push a couple buttons and you have a massage going! The 10 routines are: stretch, sleeping, relax, vitality, recovery, soft/comfortable, blood circulation, pain relief, waist massage, and power. How does it work? Simply push the “auto” button on the remote to bring up a full list of all 10 routines. Select your desired routine from the list, sit back and relax! The foot ottoman on this chair is built to extend a whopping 12.6 inches. That’s almost 5 inches more than what most massage chairs are capable of! Because the foot rest is able to extend by such incredible margins, the chair is able to accommodate user heights ranging from 5’0 to 6’6 ft. That’s 18 inches of flexibility! Quite incredible, and certainly something most chairs don’t have. How does it work? Once you’re seated, the ottoman will extend all the way out, and then slowly retract until it reaches the bottom of your feet, at which point it stops. Combined 3D & L-Track Is A Rare Find! I’m a big fan of both (3D & L-Track) of these technologies, so seeing them combined is even better. If you’ve read some of my other reviews of 3D/4D chairs, you’ll see that the only concern I have is the short tracking span. With L-Track, this is no longer an issue! Ever heard of space saving recline? It’s a feature common to most Osaki & Titan chairs. As you recline the chair backward, the seat slides forward thereby minimizing the clearance required from backrest to wall. This chair requires a mere 3.2 inches from the wall! I spoke about this earlier as well, but I wanted to mention it here again because of how important it is. This chair is able to accommodate anyone from 5’0-6’6 ft. weighing a maximum of 285 lbs. This sort of user flexibility is not something you’ll find in all massage chairs. Impressive to say the least. 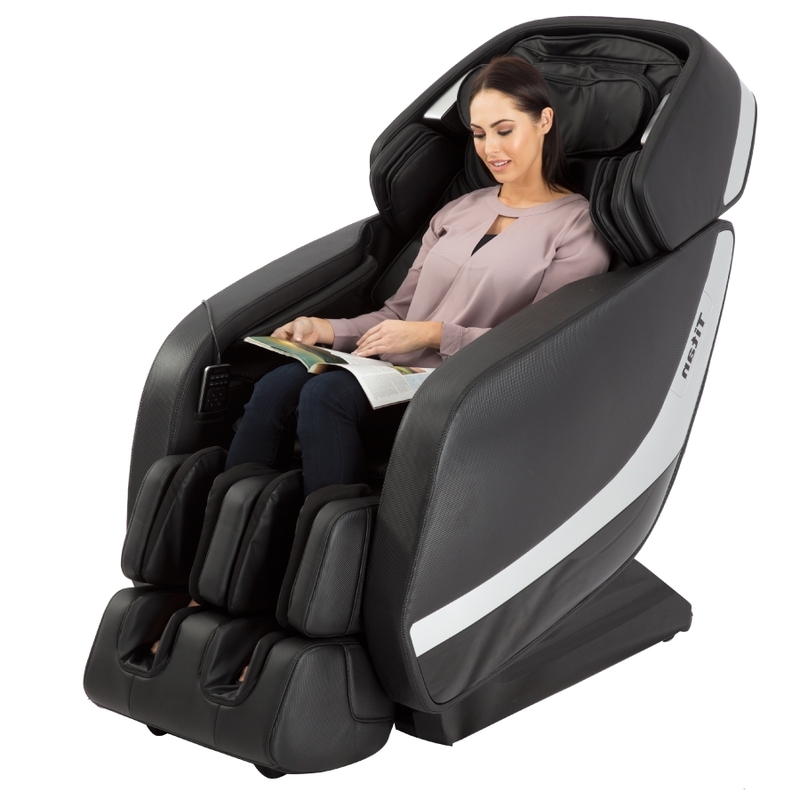 Retail price on massage chair deals is currently $3,995. This for a chair that comes with 3D L-Track rollers, 44 airbags, 10 auto programs, Bluetooth music system, and last but most definitely not least fantastic user flexibility. Don’t know about you, but this is an absolute bargain as far as I’m concerned! The one and only thing wrong with this chair is that its overall intensity is slightly lacking in comparison to other 3D/4D chairs. Most comparable 3D chairs have an overall intensity of 7-10, making them far better at “deep tissue” work. If Titan were to fix this one thing, no doubt this chair becomes a 10/10 for me! It’s all nice and good for me to ramble on about the features of this chair, but I think it’s more valuable to see how it actually compares with similar chairs on the market. All 3 chairs have one thing in common: they all have 3D rollers. The table below shows the key differences between each chair. 5’0 – 6’6 ft & 285 lbs. 4’11 – 6’4 ft & 285 lbs. 5’2 – 6’5 ft & 265 lbs. 5’5 – 6’4 ft & 265 lbs. Price—Both Titan chairs are significantly cheaper than both Osaki chairs (based on regular pricing). If you’re in the market for a low budget 3D chair, consider either of the Titan options! Roller Track—This is where the Pro Jupiter XL destroys the rest. 53” L-Track compared to a measly 31” and 32” S-Track for the other 3 chairs. It’s quite obvious who the winner is here! Auto Modes—The Pro Jupiter XL has the edge yet again. 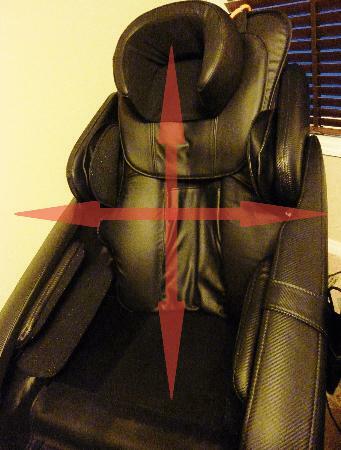 10 auto modes is the most compared to the other 3 chairs. Overall Intensity—Here’s where the Pro Jupiter XL loses out. It cannot perform at as high an intensity as the other 3 chairs unfortunately. The above in my mind are 4 critical differences worth noting. The other differences are maybe not as important. Q1. How much power does this chair consume? 250 Watts is what you can expect for power consumption. Compared to other chairs, it’s somewhere in the middle. Not too high, not too low. Q2. Where is this particular model made in? Titan Pro Jupiter XL is made in China and distributed through Titan in the USA. Majority of massage chairs sold today are made in China. Only a handful are engineered and manufactured in Japan. Osaki’s 4D is one such example. Q3. How does the chair ship? The chair is packaged in 3 different boxes. There’s one big and 2 small boxes. The big box measures 41″ x 31″ x 60″. The two small boxes measure 26″ x 16″ x 49″ and 21″ x 18″ x 21″. Q4. How simple is it to operate the chair? Incredibly straightforward. Osaki & Titan user interfaces are basically foolproof. This chair features a fairly small LCD remote that’s quite easy to navigate. Below is a video that goes over the remote functions and how to use. If you’re interested in buying this chair, you should definitely check it out! Q5. How can I find the best deal for this chair? And when is the best time to buy? Finding the best deal requires some effort on your part. As is the case with anything you want to buy, you should spend time looking around and comparing prices at different stores. Don’t limit your research to just online, see if the chair you want is available in a store near you. Too many people focus on either buying online or offline, but to find the best deal you should consider both. There is no best time to buy. The prices of these chairs change so frequently, it’s hard to specifically pick out the “best” time to buy. If the price meets your budget, buy now! Q6. Are there any special deals or discounts? If you’ve made it this far, you’ve probably come to realize that I am an affiliate. In other words, if you buy from one of my links, I will make a small commission. My links redirect you to massage chair deals where you can buy the chair. As a special thank you for supporting my site and reading this post, enter “MAM5” during checkout to score an extra 5% off. Q7. Why do you promote massage chair deals? 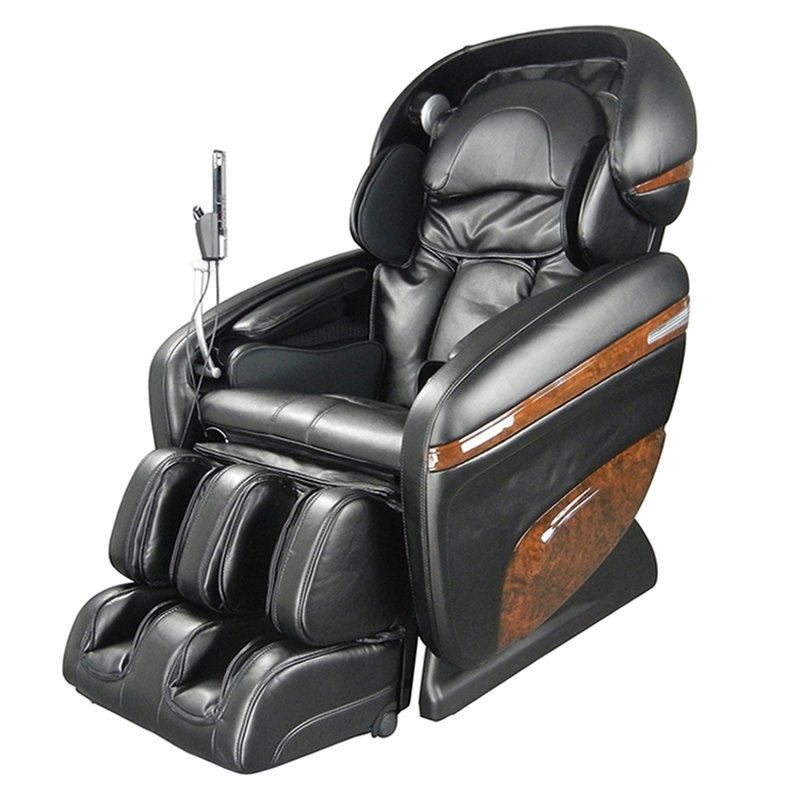 From a consumer standpoint, they are one of the best online massage chair stores. They have a lowest price guarantee so if you find lower they will price match and potentially beat. They offer free shipping, 0% financing, and most importantly they know their chairs! If you’re ready to head over to their site, feel free to use my affiliate link below. 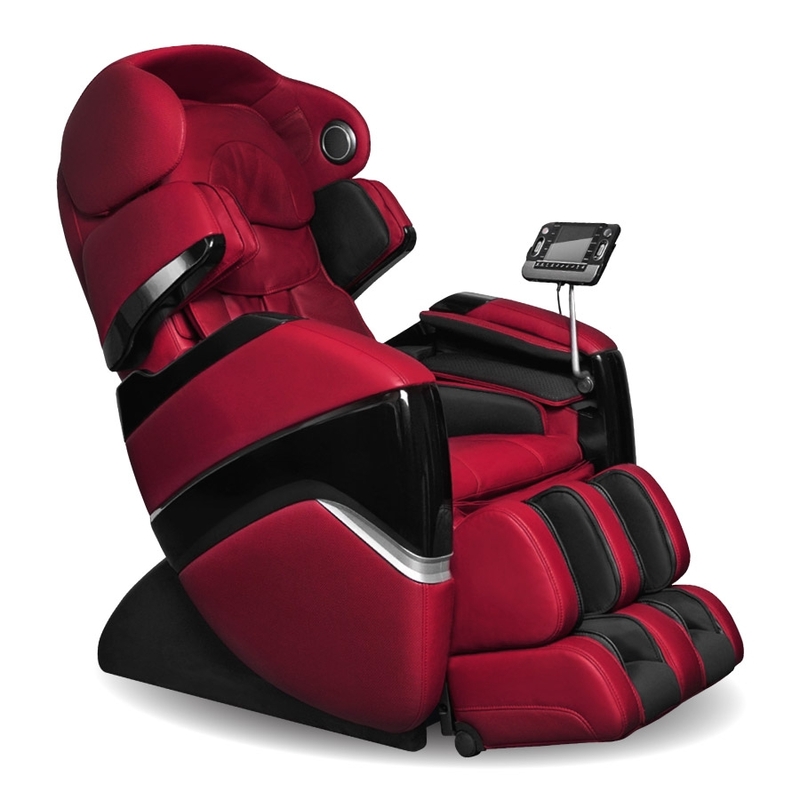 Moment of truth….should you buy the Titan Pro Jupiter XL massage chair? You’re looking for a chair with 3D rollers specifically—If you’re looking for a 3D chair, there’s not too many better than the Pro Jupiter XL. We’ve seen how it stacks up against the competition, both in terms of functionality and price! You’re looking for extended tracking range—Some people are happy with rollers that track from the neck to tailbone, others want more. If you want more roller coverage, you should consider an L-Track chair like this one! You’re okay with forgoing incredibly high intensities—As mentioned earlier this chair can massage at an overall intensity of 7-8 on a scale of 1-10. If you’re okay with this intensity range, get this chair! Else consider a different 3D or 4D chair. To reiterate what I’ve said throughout this review, Titan Pro Jupiter XL is an incredible massage chair. Its biggest highlights are the combined 3D roller/L-Track technology, and immense user flexibility. If you do have any burning questions about this chair, definitely leave me a comment and I will do my best to address. Lastly, I hope you enjoyed reading and got some value out of this review. If you did, show your support by sharing on the socials. Till next time!